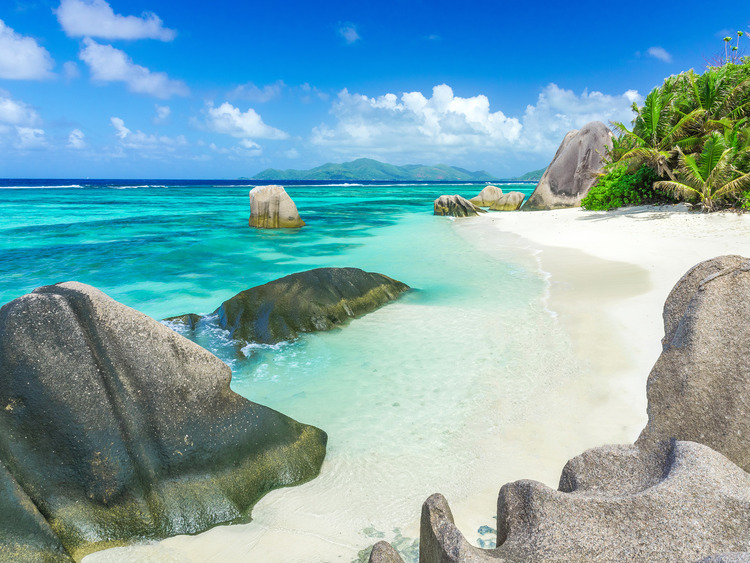 A day of tropical magic spent at the two pearls of the Seychelles with their enchanting beaches and azure seas. We'll also take a walk through a magnificent nature reserve, declared a UNESCO World Heritage Site, enjoy a typical creole lunch. A comprehensive trip to two true paradises! From Victoria, the capital of the island of Mahé and the gate to the Seychelles, we board a boat to the island of Praslin, the second largest island in the archipelago. Alighting at the quay of Baie Sainte Anne, we head for the Vallée de Mai nature reserve by minivan. From here we begin a walking of about an hour through the heart of the island in the company of our guide. We are bound to be fascinated by the Vallée de Mai, once considered to be the site of the Garden of Eden and today a worthy holder of the title UNESCO World Heritage Site. Its forest is home to numerous rare and surprising species of flora and fauna, including the coco de mer, the largest seed in the world, which has become one of the symbols of the Seychelles. It forms part of the diet of the black parrot, an extremely rare bird found in the area. We reach then Anse Lazio beach, where we'll stop briefly to take photographs and relax on the fine sands. After a break to relax or swim, we'll head for lunch at a restaurant where we'll enjoy a buffet of creole specialities. A brief boat ride takes us to the second stage of our excursion, the island of La Digue, a charming location with a laid-back, almost timeless atmosphere. Private cars and coaches are not permitted on La Digue, so we'll travel around the island on the highly colourful local modes of transport. We'll visit the Union Estate, a historic estate where we can admire the old colonial residence (visit to the exterior) and see some adorable examples of giant Seychelles tortoises. On board a highly colourful minivan we then head for the Anse Source d'Argent beach which, with its imposing and scenic blocks of granite, is considered by many to be the most beautiful beach in the Seychelles and one of the most beautiful in the world, the location for a number of adverts and photo shoots. We then return by boat to Praslin, from where we continue to Mahé and return to the ship. We recomend to bing Insect repellant. Spaces are limited, so please reserve early. Sea weather conditions could affect the transfer from Mahé to Praslin and could cause seasickness.